The right side wheel arch was the first area to be repaired. I started by annealing a piece of aluminum. 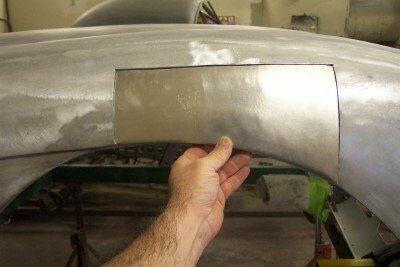 This process leaves the metal ‘dead-soft’ and relatively easy to work. The 90 degree lip of the wheel opening is formed first since this is the most extreme bend. This operation was performed on the bead-roller with some help from the stretcher. The rest of the shape is made with the shot bag, hammers and a bit of e-wheel work. When the piece has the proper shape I file the edges nice and straight. A curved tooth body file works well here. Lines are scribed on the existing fender and cuts are made to the inside of the marks. I’ll file the opening to size so that I have a very narrow kerf. This makes welding much easier and results in an all around better job. After TIG welding the repair panel into place the weld beads are dressed down so that the thickness of the weld is similar to the sheet metal. Now the fender can be straightened and metal-worked.